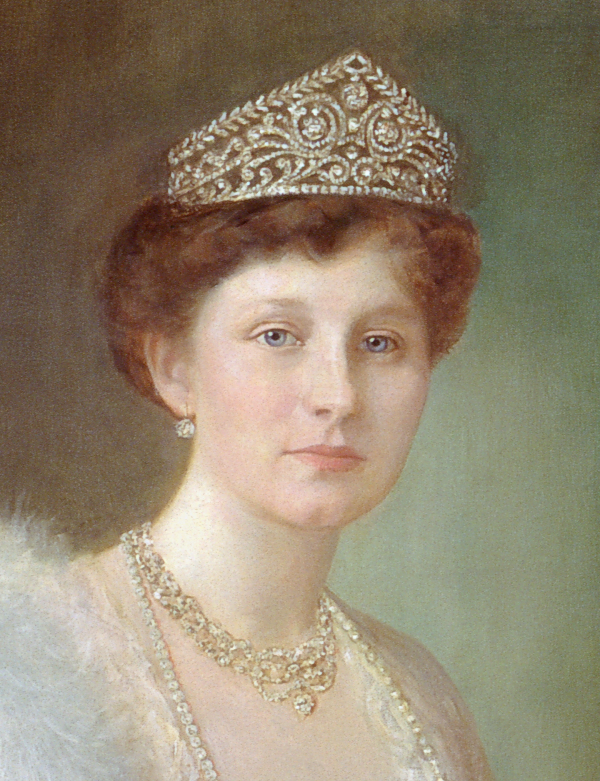 Princess Viktoria Luise of Hanover, Duchess of Brunswick (born Princess Viktoria Luise of Prussia) wears the Brunswick Tiara in a portrait painted by Gustav Rienaecker, ca. 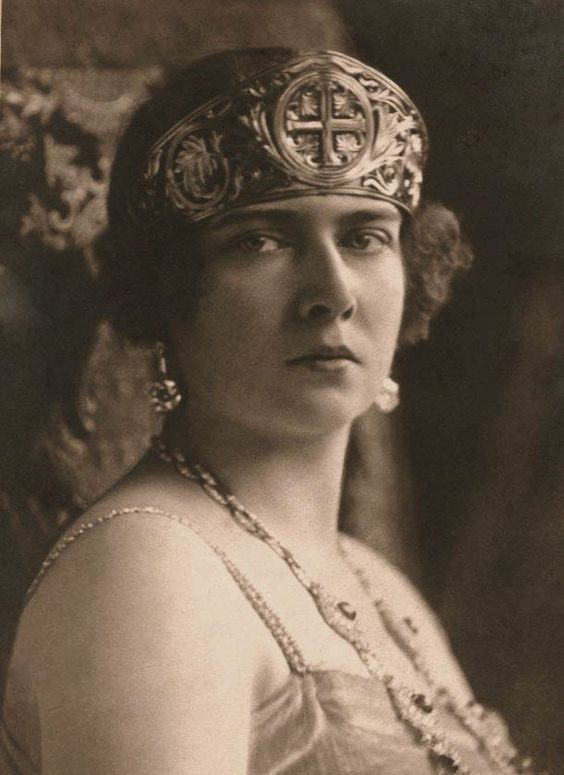 1913; read more about this intriguing tiara over here! As an exciting royal November draws to a close, we've got one more celebration of the month's warm, cozy birthstone. Royals love citrines and yellow topazes, as you can see from the numerous posts we've written about those jewels over the past three years. 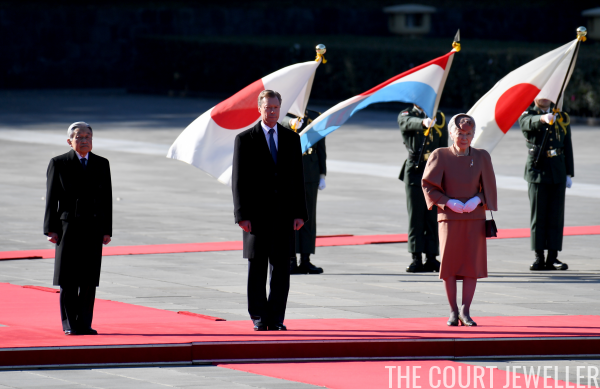 Here's a roundup of some of the best! 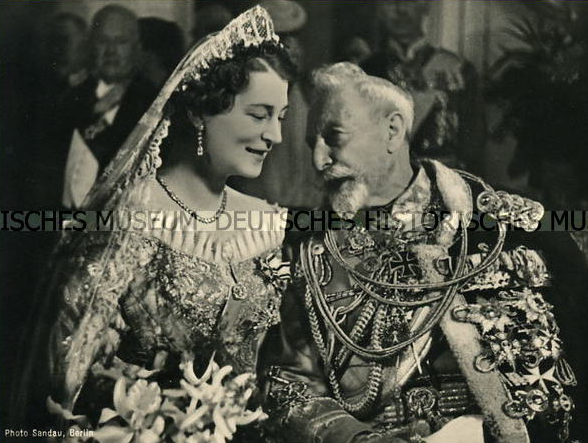 Grand Duchess Kira Kirillovna of Russia, pictured with Kaiser Wilhelm II of Germany, wears the Prussian Meander Kokoshnik at her wedding to Prince Louis Ferdinand of Prussia, May 1938; read more about the lengthy history of this tiara over here! 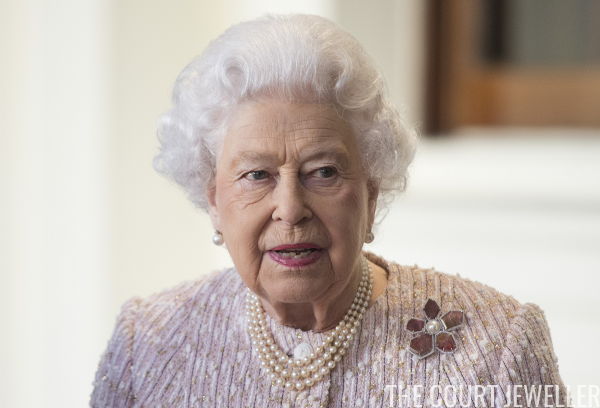 Queen Elizabeth II of the United Kingdom was a busy bee on Tuesday, hosting a foreign president for lunch and holding diplomatic audiences at Buckingham Palace -- and she wore one of her most modern, colorful brooches for the day. 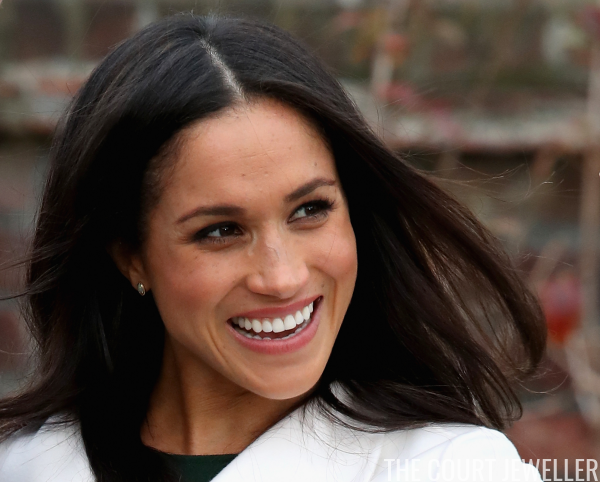 We've all (appropriately) been paying attention to the diamond engagement ring that Meghan Markle debuted at Kensington Palace on Monday, but the ring wasn't her only piece of jewelry at the photocall. Here's a look at the petite earrings that Meghan wore for the couple's big moment. 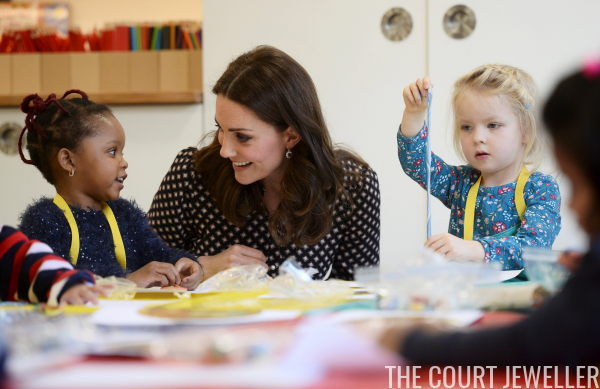 Amid all the royal engagement excitement, the Duchess of Cambridge stepped out in London on Tuesday morning for an engagement of her own at the Foundling Museum. 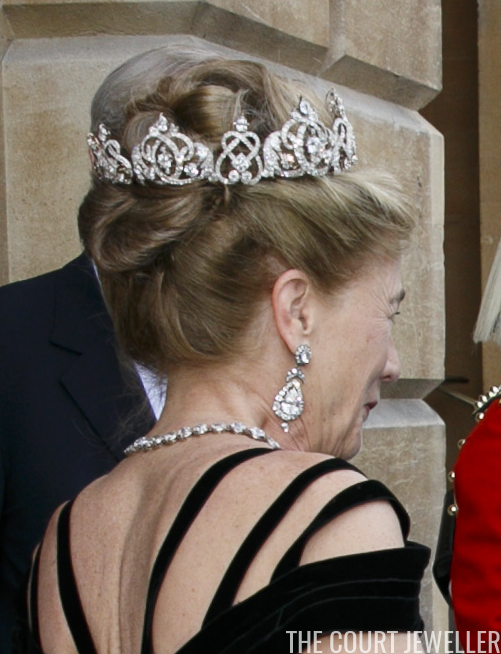 The Duchess of Wellington, born Princess Antonia of Prussia, wears the family's diamond tiara for the Waterloo Banquet at Apsley House, June 2015; more on the event (and the tiara!) over here! New Harry and Meghan Wedding Details! 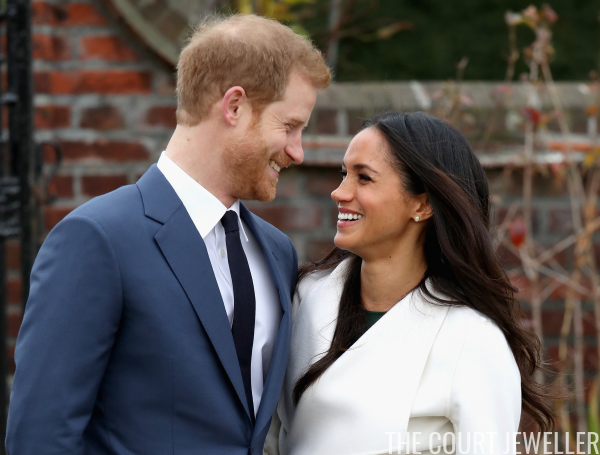 Yesterday, we got an official announcement, photos, an interview, and a big ol' diamond ring, and now today, we know a lot more about when and where Prince Harry and Meghan Markle's royal wedding will take place. 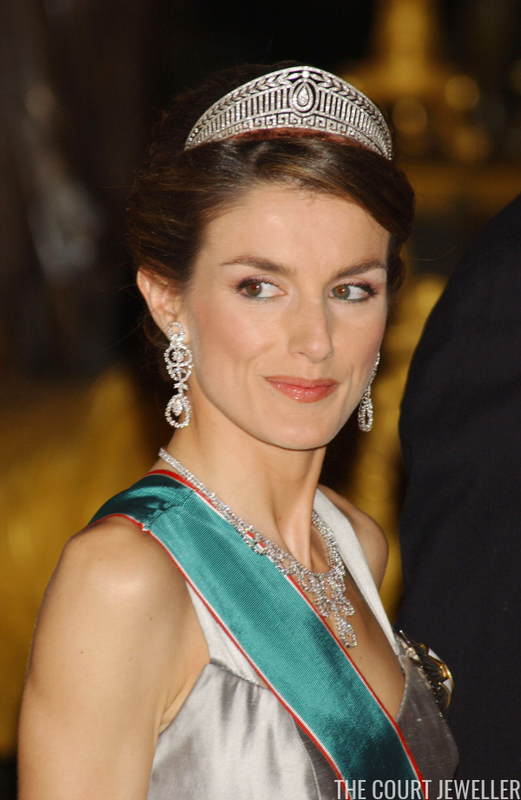 Queen Letizia of Spain, then Princess of Asturias, wears the Prussian Tiara with a suite of diamond jewels at a gala dinner for the Hungarian president, January 2005; more on the tiara over here! 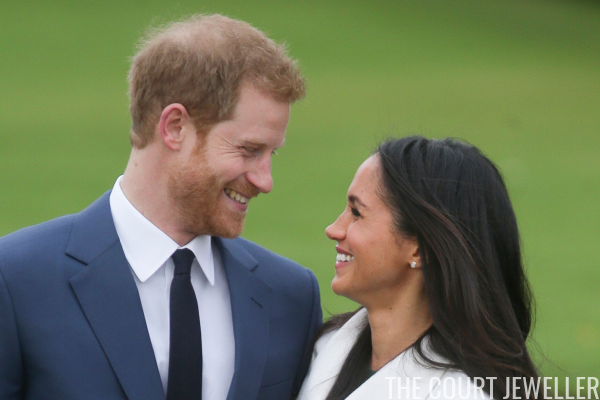 Prince Harry and Meghan Are Engaged! Break out the champagne, magpies: Prince Harry and Meghan Markle are officially engaged! I'll be updating this post throughout the day as we get more information on the ring and the proposal, but feel free to use this post for discussion as events happen! 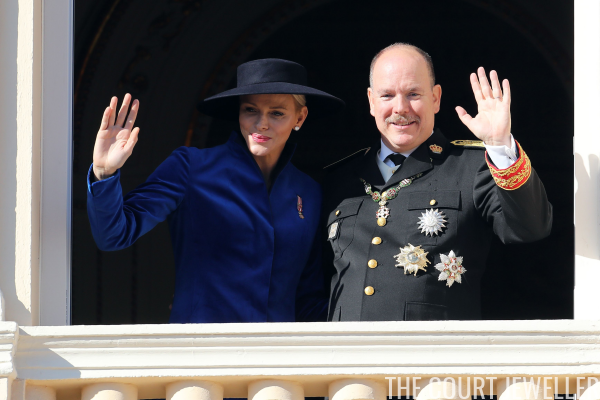 She's a member of the House of Orange, so it's very appropriate that Queen Maxima of the Netherlands wears an extensive collection of jewelry set with orange gemstones. It's said that these pieces are made of citrines, though it wouldn't surprise me if there are a few orange topazes sprinkled throughout. 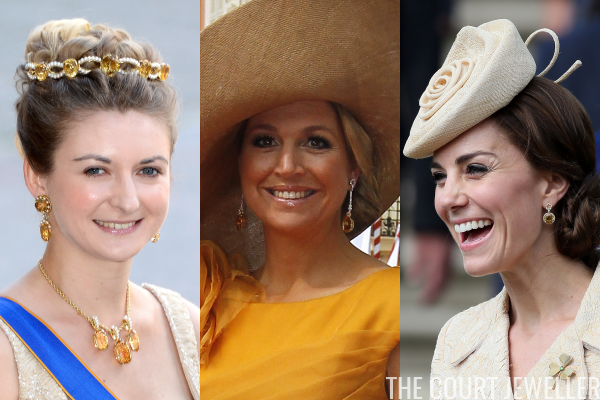 Here's a look at some of her sparkling citrine jewels. 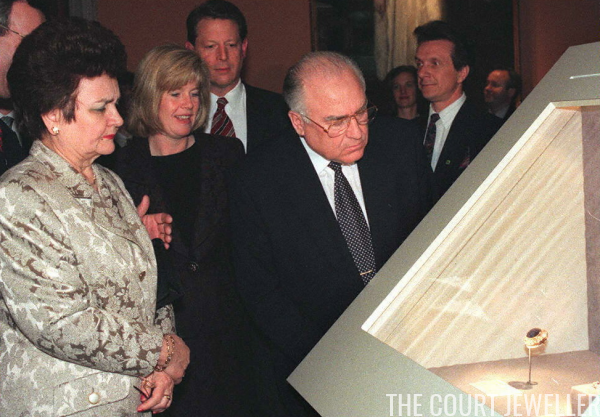 To wrap up our month-long peek into various jewel exhibitions, we're traveling to Washington, D.C., for the landmark Romanov display at the Corcoran Gallery of Art two decades ago. Enjoy a little bit of the experience for your self -- in motion! 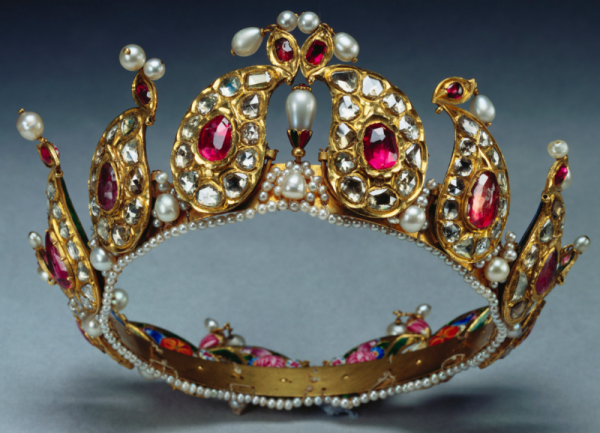 The Indian Ruby, Lasque, and Pearl Tiara, which has been in the Royal Collection since the 1920s, belonged to Queen Victoria and the Duchess of Albany; learn more about it over here! 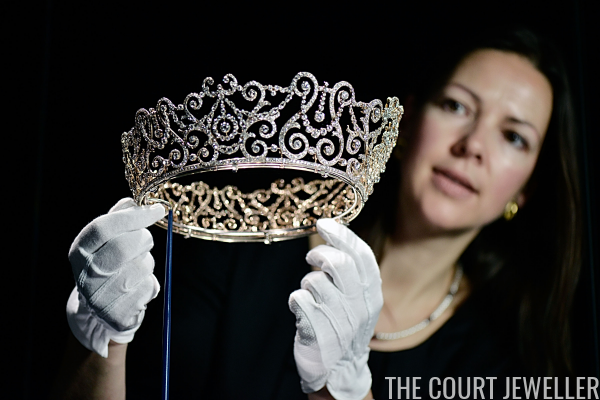 With the Nobels coming soon in all their glittering glory, what better way to spend a Saturday than with one of the Swedish royal family's most recognizable tiaras? 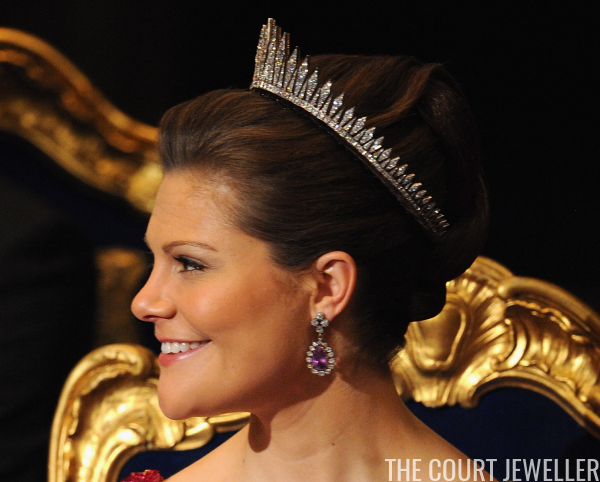 Today, we're looking at the history of one of Crown Princess Victoria's favorite sparklers, the Baden Fringe Tiara. 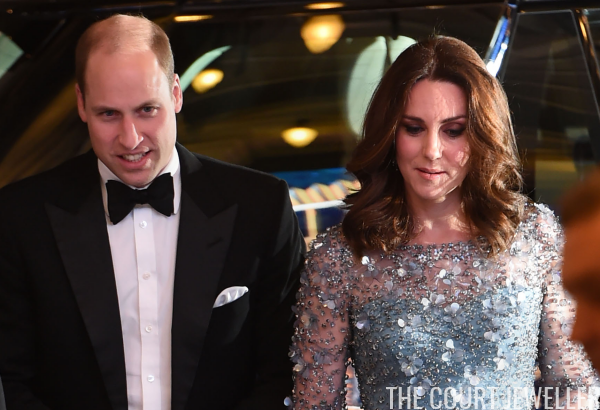 The Duke and Duchess of Cambridge stepped out in London on Friday night to attend the annual Royal Variety Performance, and Kate chose head-to-toe sparkle for the event. 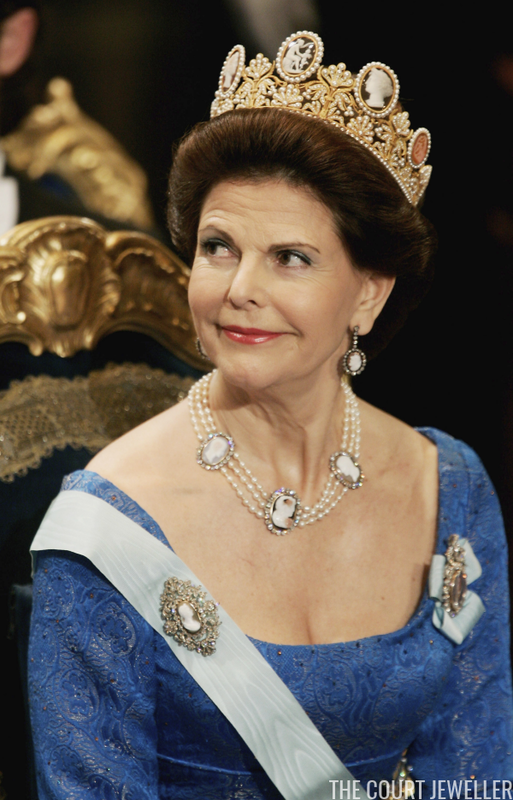 Queen Silvia of Sweden wears the Cameo Tiara and jewels from the coordinating married parure at the Nobel Prize Ceremony, December 2005; read much more about the cameos over here! 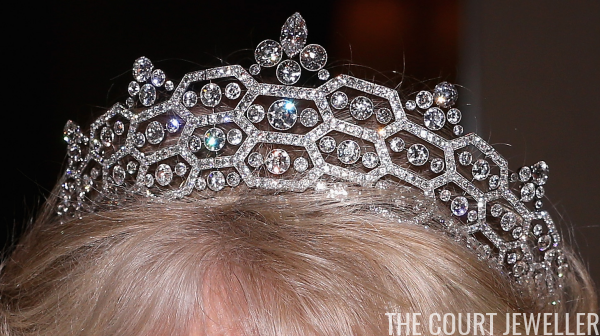 The Bernadottes were out in force on Thursday for two glittering events -- and one of them brought us a majorly surprising tiara moment. 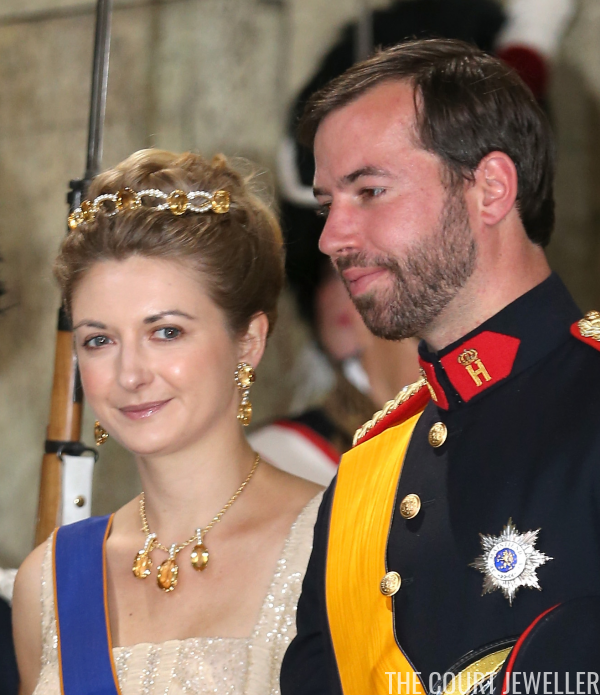 Hereditary Grand Duchess Stephanie of Luxembourg wears the tiara and jewels from the family's citrine/topaz and pearl suite at the wedding of Princess Madeleine of Sweden, June 2013; read more about this parure over here! I'm incredibly thankful that so many of you take time out of your busy lives to read and enjoy the posts and articles on this site. Thanks so much for your expertise, your kindness, and your enthusiasm! I'll be raising my glass in your honor today! 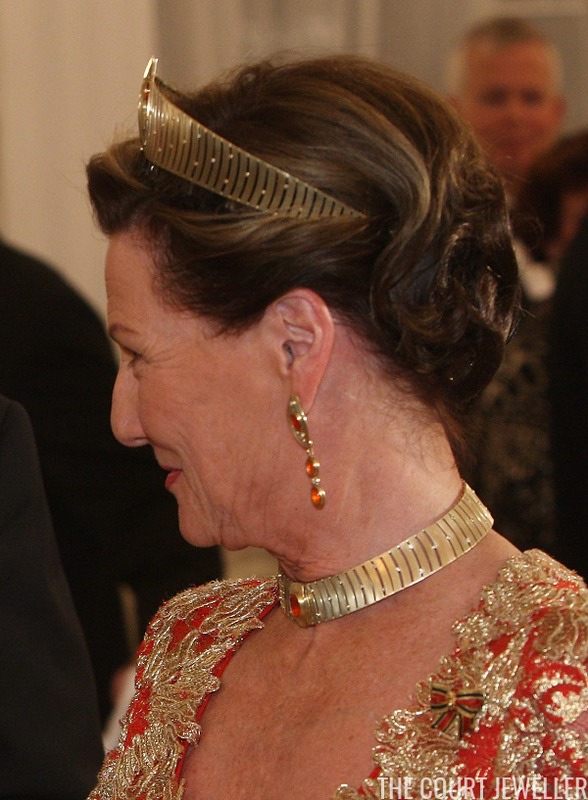 Queen Sonja of Norway wears her Modern Gold Tiara with its coordinating jewels during a visit to Germany, October 2007; read more about the set over here! 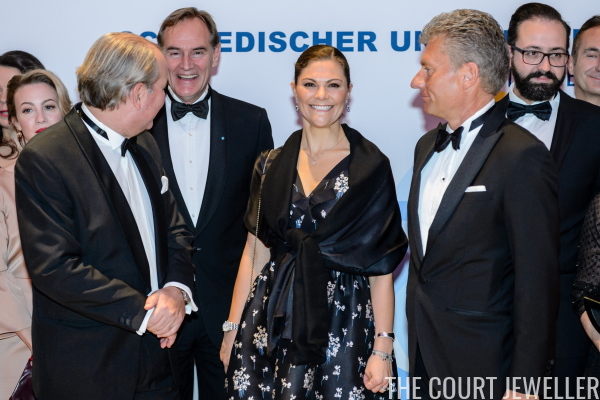 On Sunday, the Monegasque princely family celebrated the principality's national day with patriotic day and evening festivities. 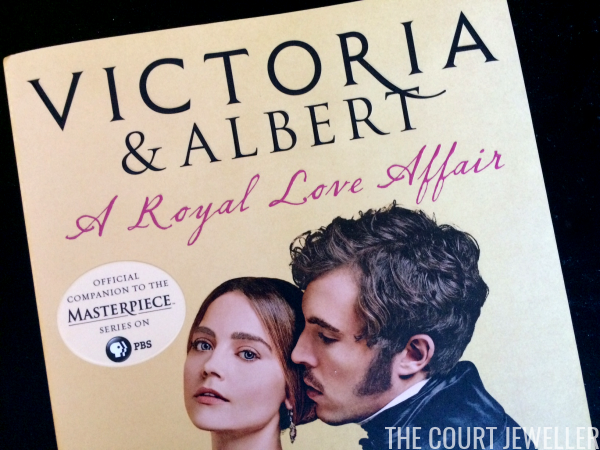 I've got a treat today for those of you who are fans of Victoria, the show co-produced by ITV and PBS about the life of the young Queen Victoria and Prince Albert. St. Martin's Press has just published another companion volume to the series, and I've got a review -- and a chance for you to win your own copy! 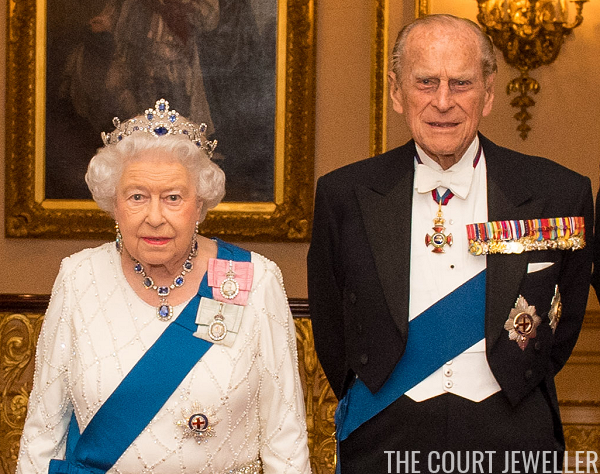 The Queen and the Duke of Edinburgh threw a party for their platinum anniversary at Windsor Castle this evening, and we got a glimpse of a new piece of borrowed jewelry on the Duchess of Cambridge. 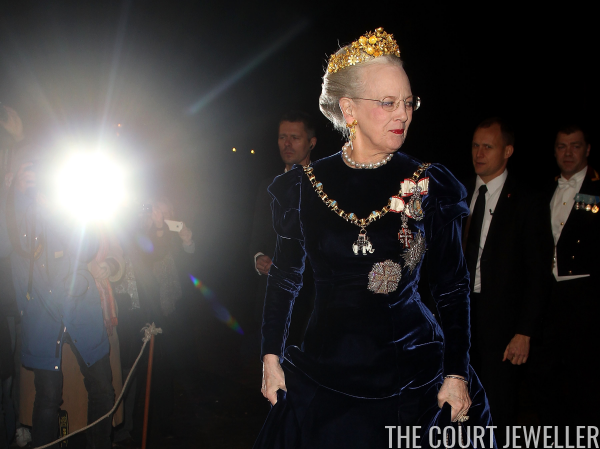 Queen Margrethe II of Denmark wears the Naasut Tiara at the annual New Year's levee in Copenhagen, January 2012; read more about the suite of golden jewels over here! "Splendour of the Abbey Scene"
LONDON, November 20 -- The cream and gold, crimson-cushioned chairs of the sanctuary were empty, the carpet untrodden, and, all unobscured, the gold plate mass on the snowy cloth of the High Altar gathered the warm flickers of the chandeliers, heightened them, and sent a ray of dazzling light from end to end of the Abbey. 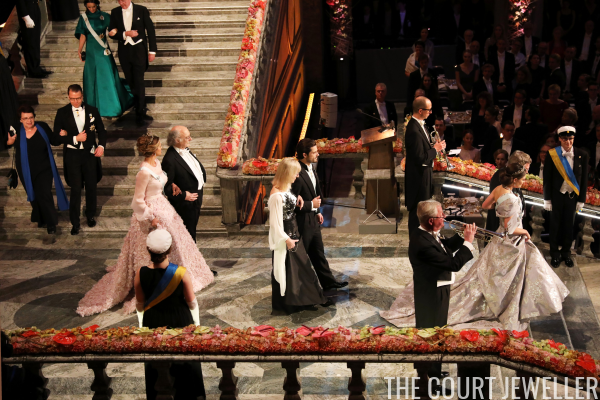 The arriving guests, shown to their places by the gentlemen ushers and gold staff officers, made no more than the faintest rustling as they moved. The Abbey waited and, like a shell which confides most gently the roaring sound of the sea, trembled and stilled, stilled and trembled to the rising and falling waves of applause from that invisible multitude in which these ancient walls were islanded. 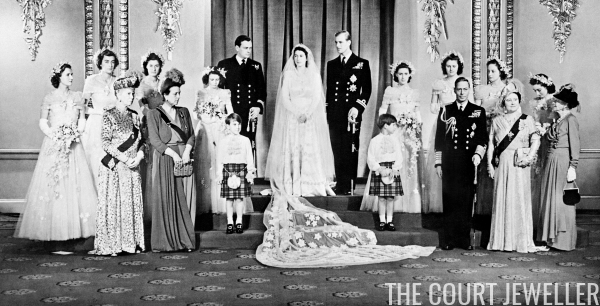 Princess Elizabeth (now Queen Elizabeth II of the United Kingdom) wears Queen Mary's Fringe Tiara, borrowed from her mother, on her wedding day in November 1947; read all about the tiara over here! 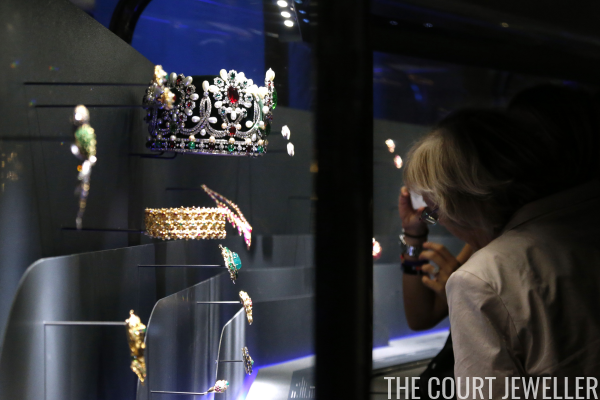 Five years ago, the exhibition space at Buckingham Palace glittered with more than ten thousand diamonds, all set in priceless pieces of jewelry that belong to Queen Elizabeth II. Today, I've got a view of the exhibition for you -- and since it's in GIF form, you'll feel like you're really there! 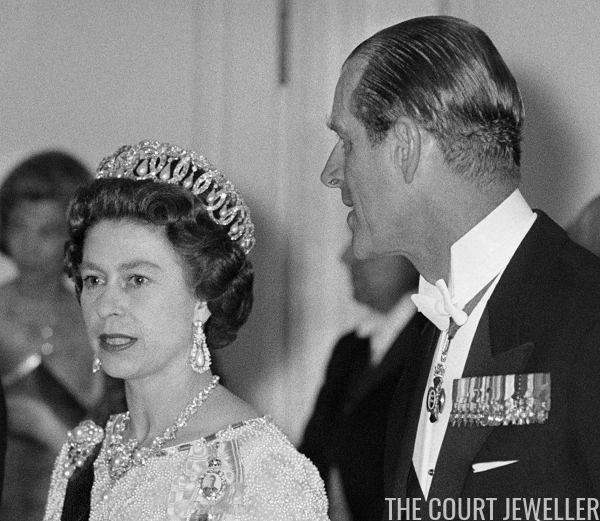 Queen Elizabeth II wears the Vladimir Tiara with Queen Victoria's Golden Jubilee Necklace, Queen Alexandra's Wedding Brooch, and the Duchess of Gloucester's Pendant Earrings at the Palace of Versailles during a state visit to France, May 1972; much more on the tiara over here! 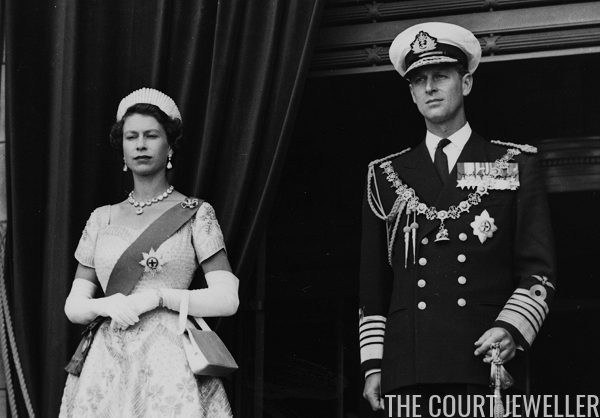 Our month-long focus on Queen Elizabeth II's wedding gift jewelry arrives today at two pieces with serious British royal history: the Queen Anne and Queen Caroline Pearl Necklaces. 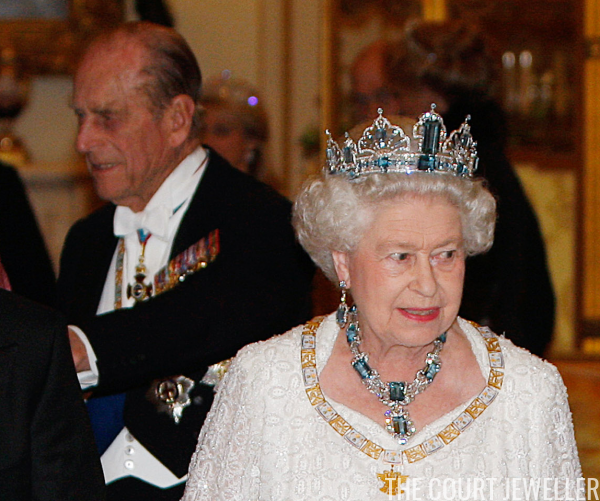 Queen Elizabeth II wears the Brazilian Aquamarine Tiara during the Mexican state visit, March 2009; learn about the evolving aquamarine parure over here! 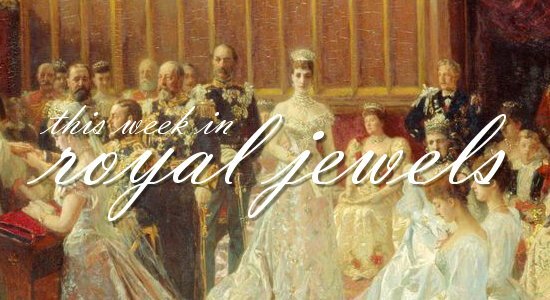 It was an incredibly busy royal week, and it was a major challenge to narrow down the week's best jewels! Don't forget to vote for your favorites in the poll below! 10. Princess Marie of Denmark visited her native France on Wednesday, wearing a pair of pave-set diamond disk earrings with an embellished coat to switch on Christmas lights in Paris. 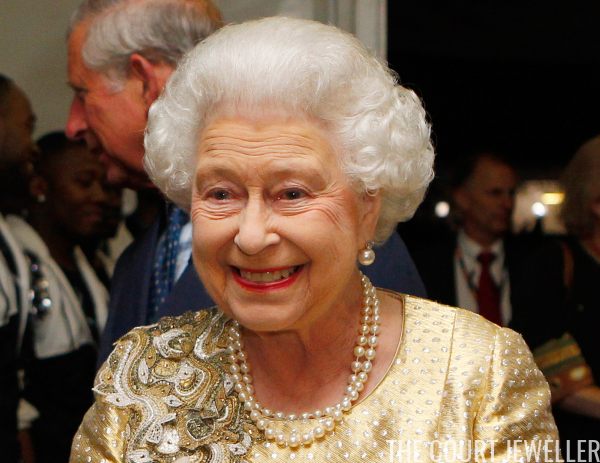 Queen Elizabeth II of the United Kingdom wears the Belgian Sapphire Tiara at the annual diplomatic reception at Buckingham Palace in December 2016; more on the tiara over here! 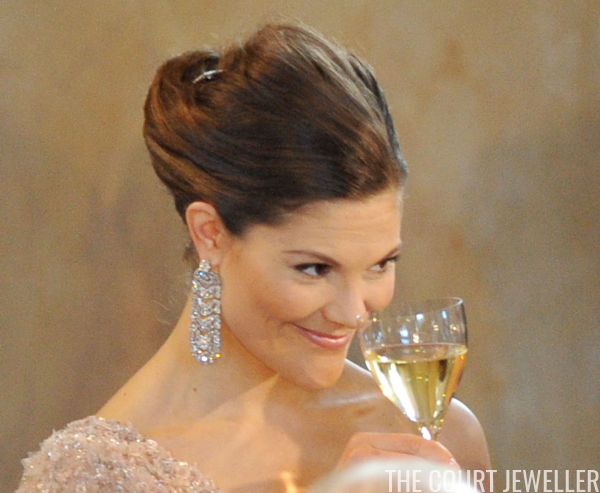 Way back in the days of Mad Hattery, I nicknamed this glittering sparkler "The Mighty Bouch." It's easy to see why -- the sparkle from this thing packs quite the punch! 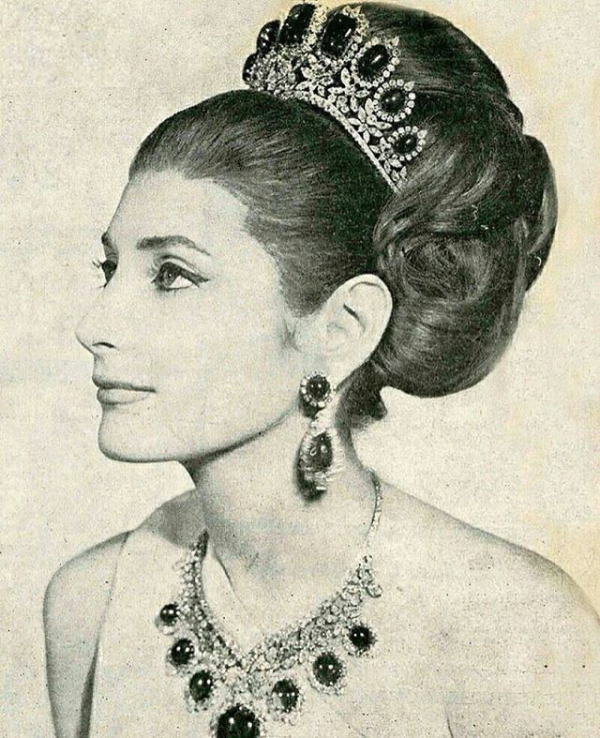 Most of us used to call it "the Boucheron Honeycomb Tiara," but in 2012, we learned that the royal family simply calls it "the Greville Tiara." Either way, it's impressive -- and even more so when you view it close up! 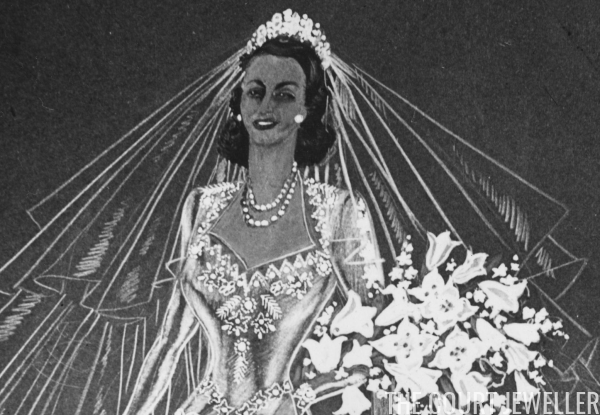 Queen Elizabeth II wears Queen Alexandra's Kokoshnik with the Coronation Necklace and earrings and one of Queen Victoria's Bow Brooches during the 1954 tour of Australia; read more about the tiara's fascinating history over here! "Rich Materials for Princess's Wedding Dress"
LONDON -- On a red satin settee and a leopard skin rug in the lush, empire-style "designing room" of the royal couturier, Norman Hartnell , lie the two top-secret breathtaking bales of material of Princess Elizabeth's wedding dress and going-away outfits. 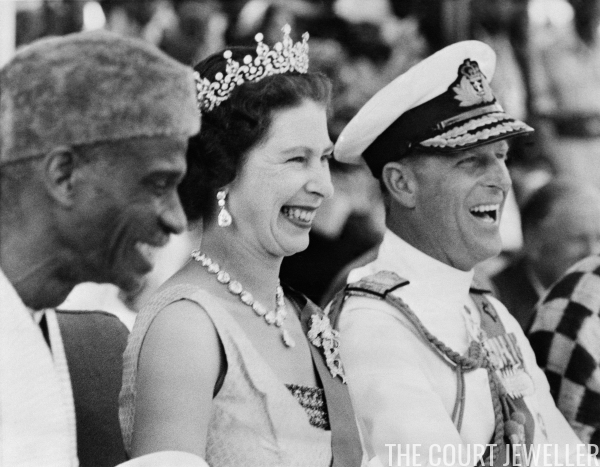 Queen Elizabeth II wears the Girls of Great Britain and Ireland Tiara with the Coronation Necklace and Earrings and Queen Mary's Lover's Knot Brooch during a visit to Sierra Leone in December 1961; read all about the tiara over here! Queen Rania of Jordan was in the capital city of Amman on Sunday to attend the opening of the ordinary session of parliament. For the occasion, she combined businesswear with sparkling jewels. 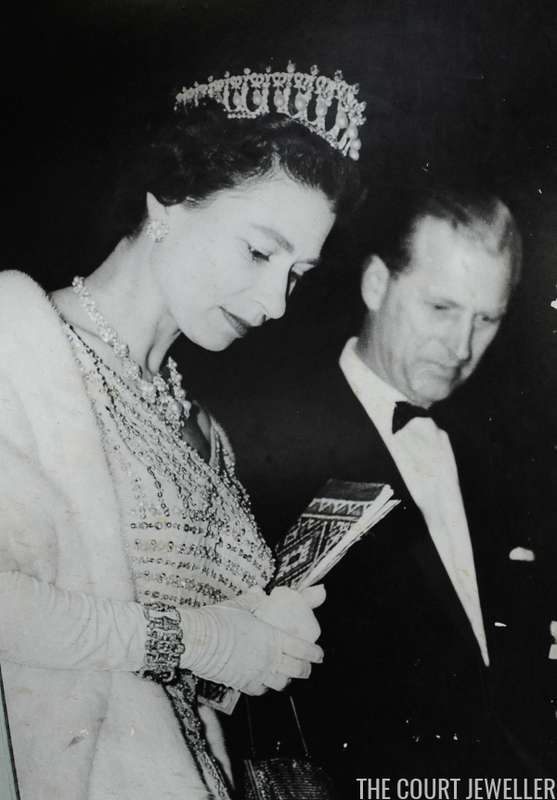 Queen Elizabeth II of the United Kingdom wears Queen Mary's Lover's Knot Tiara with Queen Victoria's Golden Jubilee Necklace and one of Queen Mary's Chain Link Bracelets during a visit to India in 1960; learn more about the tiara, most recently worn by the Duchess of Cambridge, over here! 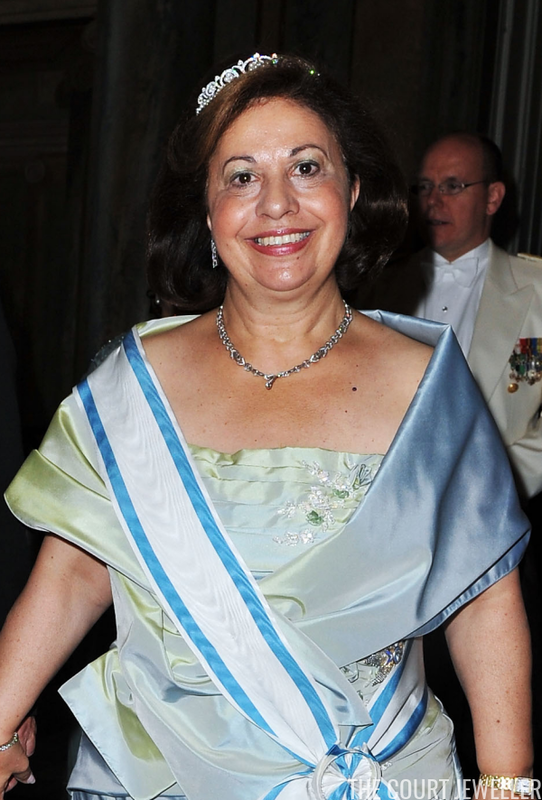 Katherine of Serbia, the wife of Crown Prince Alexander, may not have a throne, but her husband's royal family ties mean that she often attends tiara events. 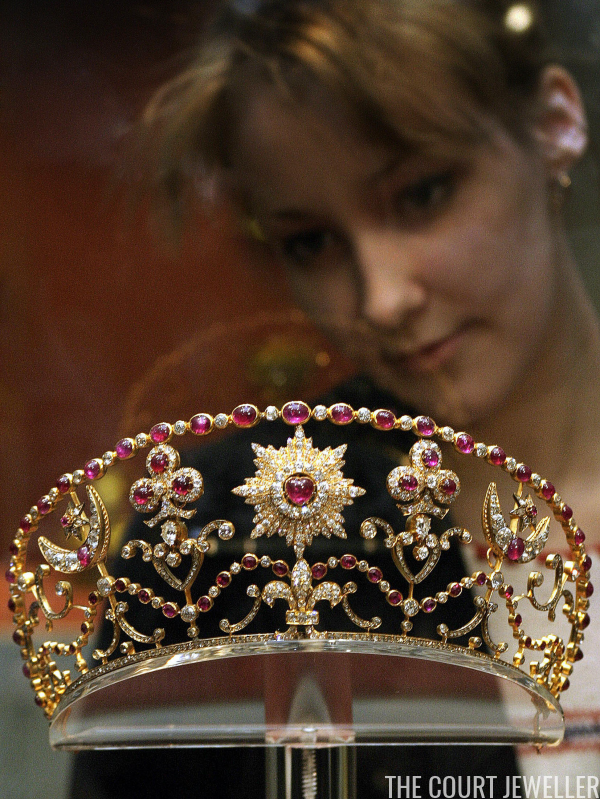 To celebrate her birthday, we're taking a look at one of the small tiaras that she has worn on these occasions. 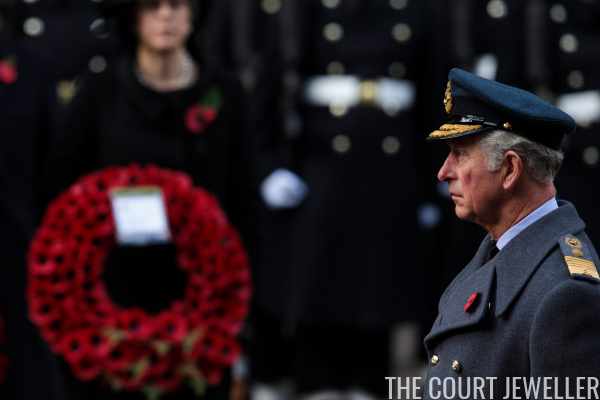 The British royal family gathered in London today to mark Remembrance Sunday, with solemn ceremonies dedicated to those who have honored the nation with their military service, as well as those who have given their lives for their country. 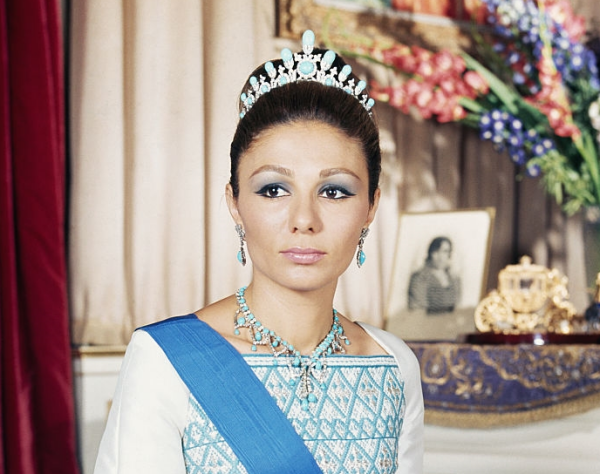 In 2012, the Museum of Decorative Arts in Paris hosted an exhibition of iconic jewels made by Van Cleef and Arpels, including several royal pieces. Today, we've got a front-row seat to the show -- in motion! 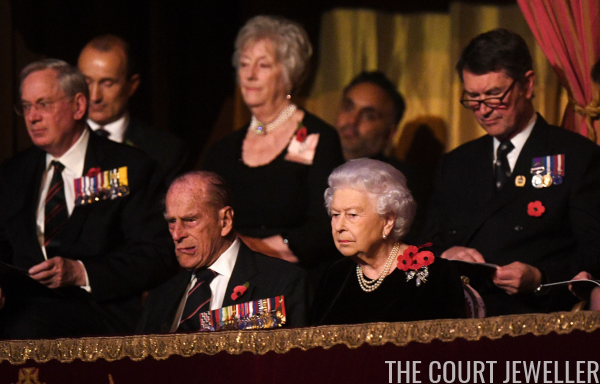 Ahead of tomorrow's Remembrance Sunday commemorations, the British royal family gathered at the Royal Albert Hall in London for the annual Festival of Remembrance. 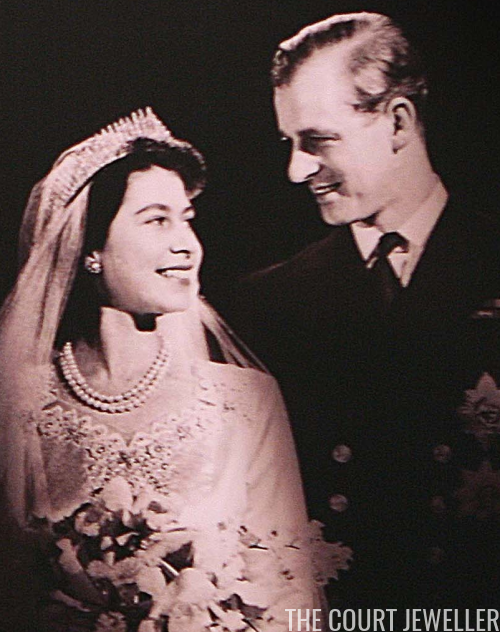 This month, we're spending our Saturdays with some of the glittering wedding gifts presented to Princess Elizabeth of the United Kingdom when she married Lieutenant Philip Mountbatten. 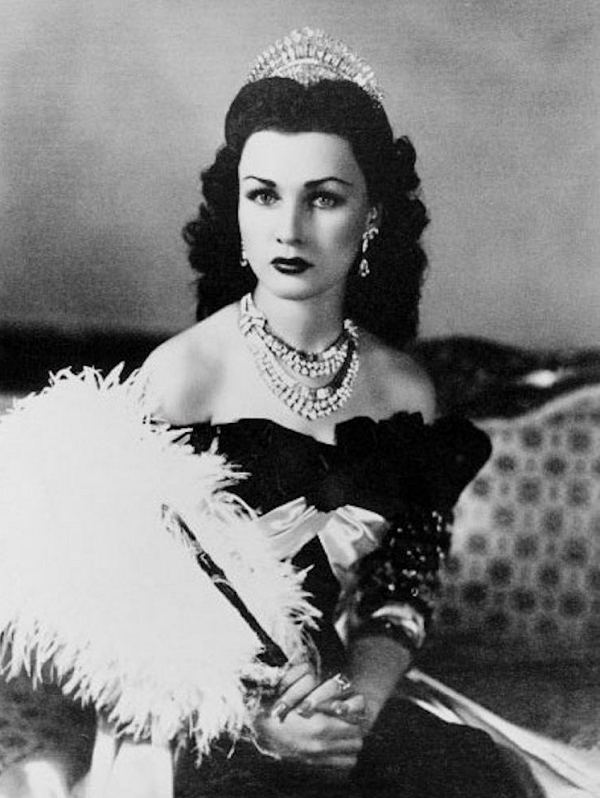 Today, we've got a sparkling suite of diamond jewels from Cartier, the princess's gift from the Nizam of Hyderabad.